It seems Minsk has found the direction that suits them perfectly. This is a much more matured release compared to their last LP, ‘Out of a Center Which is Neither Dead nor Alive’, not that you couldn’t hear the progression that was already apparent, though. The music differing between the all-out barrage of distortion and rampant screaming, trying to subtly cover the melodic undertones to the songs… then at other times, there’s an almost ‘doped-up’ style of playing. Down-tempo, echoing vocals, and a void-like atmosphere that makes songs such as Mescaline Sunrise seem perfectly titled. Even during the heavier parts, the album keeps up a consistent sound that lends to the overall composition of the album. This offers a whole new experience to the listener, and a deceptive one at that. 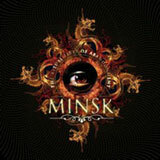 The mellow atmospheric production, intelligent piano, electronics, saxophone, and other various instrumental interludes (that are included to compliment the music, rather than to add a “willingness to branch out” that so many other bands use them for), and an overall sound that feels as though some real work has gone into discovering just what style suits Minsk the best. The misleading style of the music, allowing the listener a relaxed atmosphere before building up to a crescendo where it reminds you just what kind of animal you’re hearing. It sometimes feels as though the music itself is making you stoned before crashing you back down to the aggressions of the guitar and roar of the vocals. To say that this occasionally edges towards a stoner doom territory… would be an understatement. If this is a taste of what’s to come in 2007, then this should be an exciting year for metal.